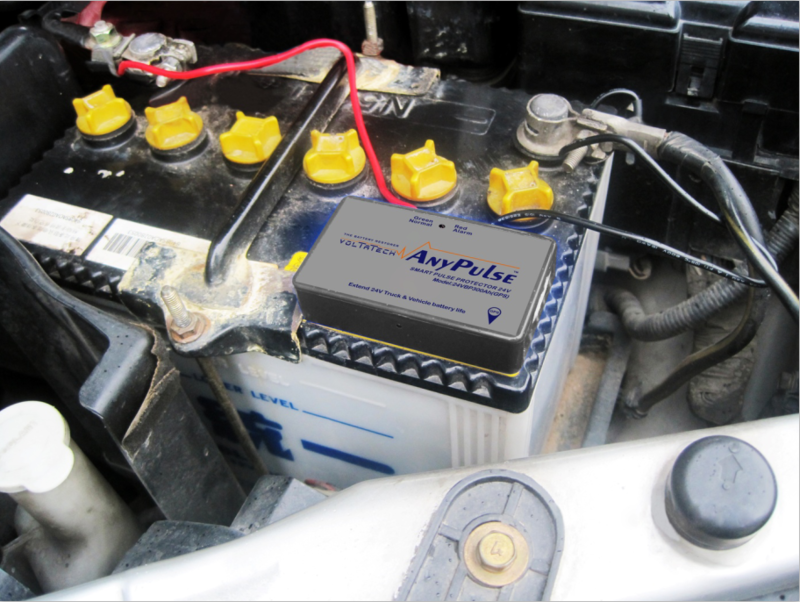 The start-up battery is the soul of your vehicle. It starts the Engine, and generates the energy necessary for the operation of all other vehicle's electric aspects. But did you know that it only has two years of life approximately because the battery's negative plate is sulphated fast. Reducing the functional capacity of the battery until its complete inoperative. Nothing could be done about this because the unpredictability inherent with common use of the battery within any vehicle's given environment was in control. But in 1998, a pulse desulphation technology product named Start-up Battery Protector for Trucks --iProtector 12T was developed by our R&D team and patented that I believe revolutionized Battery Care Extend Battery Life methods to lengthen the startup battery lifespan. This revolutionary Battery Protector saves time, money and effort by reducing battery-related downtime, maintenance and replacement. Congratulations, you now finding out the most effective method available for ensuring battery reliability--the stat-up Battery Protector and Battery Saver special for vehicle starter batteries as well as lead Acid batteries of Bus, Truck, Car, Boat, Solar Energy, etc. Choose a battery smooth surface with no heat, no overflow acid and not sealed, wipe out the dust and water vapor; tear off the double-sided adhesive protective film at the bottom of the Battery Smart Pulse Protector, press to the installation position,(suggest to prepare glass-rubber or AB glue to make the protector bottom firmly adhesive). Loosen the fixed screw on battery pole, connect the black wire of protector to the negative(-) terminal of the battery, the red wire to the positive(+) (refer to the drawing below), and then tighten the screws of battery. The 24V Truck Starter Battery Pro-- iProtector 12T identified herein is covered by a 2-YEAR warranty valid from the date of purchase. This warranty covers defects caused by faulty components or workmanship, including the labour required for repair in our authorized workshops.This warranty does not cover defects caused by incorrect installation, improper use or abuse. The existence of such causes shall be determined by our workshops technical services. Looking for ideal Truck Start Up Battery Pro Manufacturer & supplier ? We have a wide selection at great prices to help you get creative. All the Truck Starter Battery Plus are quality guaranteed. We are China Origin Factory of Truck Battery Care and Life Saver. If you have any question, please feel free to contact us.